Calling all savvy 1-bedroom buyers! Look no further for a mint 1-bedroom condo with LOW common charges, 421a tax abatement AND your own deeded parking space in Prospect Lefferts Gardens! 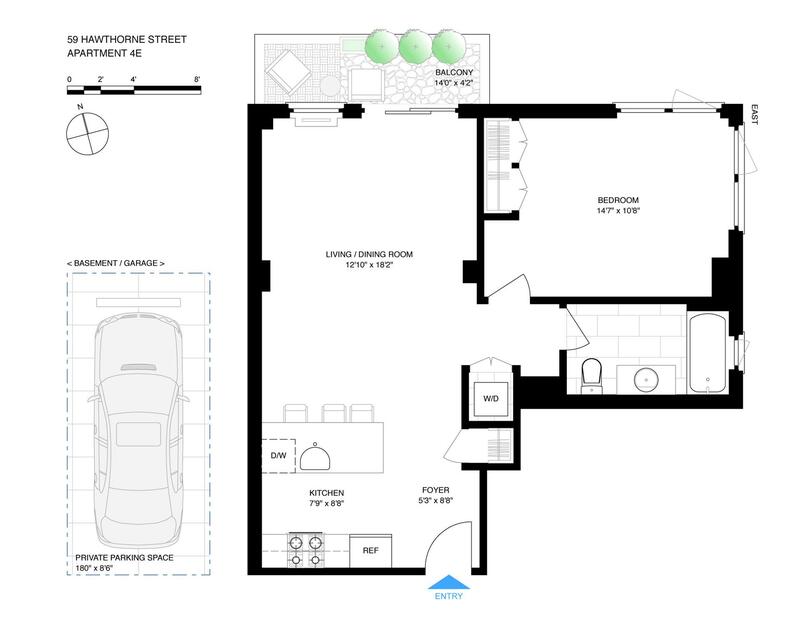 This 1-bedroom 1-bath home with private balcony is both contemporary and charming, showcasing the perfect blend of sleek modern finishes in a bright and welcoming space with over 9' ceilings, beautiful hardwood oak floors and an open floorplan. The chef's kitchen is open to the living room and features stainless steel Frigidaire appliances, including a dishwasher and built-in microwave and gorgeous white quartz countertops and breakfast bar for casual dining. The living room is quiet and bright with northern exposures and a nicely proportioned space that can accommodate a dining area just off of the kitchen. A natural extension of the living room, the sweet and serene balcony could be the perfect spot to enjoy your morning coffee. The spacious bedroom enjoys excellent light with dual exposures, east and north and it also boasts excellent storage with two closets. The windowed bathroom is tastefully appointed with sophisticated neutral finishes including a Toto toilet, soaking tub and modern vanity. This mint condition home truly has it all including your own washer and dryer as well as a highly coveted deeded parking space. 59 Hawthorne Street is a pet-friendly, beautifully maintained, boutique, elevator condominium with video intercom, deeded on-site parking, deeded storage bins, and common roof deck. Conveniently located near multiple subway stations makes commuting a breeze with easy access to the B, Q, 2, and 5 trains. Come and discover the great restaurants, cafes and amenities on bustling Flatbush Ave and the quiet, tree-lined residential streets with beautiful townhouses and low-rise buildings. Enjoy low common charges and a 421a tax abatement until 2026!